A mother who was in the high street when three youths were attacked this afternoon has said shoppers were left ‘shocked and panicked’ by the incident. Two teenagers have been taken to hospital with serious injuries after they were stabbed in the high street at just before 2.45pm today (Wednesday, March 28). A third boy, aged 16, suffered minor injuries but is not believed to have been stabbed, police said. 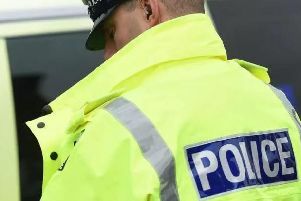 A 16-year-old boy has been arrested on suspicion of three counts of grievous bodily harm with intent and remains in custody, confirmed police. Claire Horn, of Linden Road, Littlehampton, was in the high street with her mother and her two-year-old daughter at just before 3pm. She said they visited Divine Nail Bar, near to where the incident occurred. The 36-year-old said: “The paramedics and police cornered off the area and put Superdrug shopping baskets over any evidence. “As we entered Divine Nail Bar, people were going to shops to hide. “Once inside Divine Nails there was lots of police and paramedics and lots of people hovering around – it was pretty scary. “The police were letting no-one in or out of the area. “I think everyone in the area were shocked and panicked. “I was worried to come out of the shop as I had my two-year-old daughter. “When we wanted to leave Divine Nails the police made us wait and escorted us around the edge of the crime area. “We could see blood around the Superdrug shop window area. When she overheard people discussing the attack, she said: “We just wanted to get home safe. “When we realised what was happening we were nervous. “Lucky my daughter slept through the whole commotion as they do. A 27-year-old from Wick, who asked not to be named, said he saw the aftermath of the attack. He said: “There was blood all over the floor. “There were two boys on the floor getting first aid. One of them looked in a really bad condition. “I’ve never seen so many police in all my life. Jamie Ellen, from The Vapour Shop further down the High Street, said she saw police cars driving past and heard sirens. Several shops were forced to close after police cordoned off the area, she added. Police said the five people involved in the attack are believed to be known to each other. Officers remained at the scene this afternoon collecting forensic evidence.